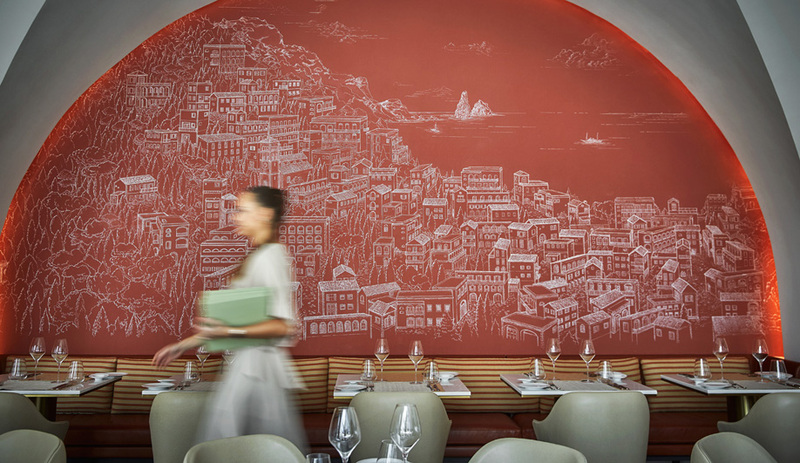 ’Tis the season for outdoor installations, designed by architects and artists for amusement and analysis. Here are five more of the year’s best summer pavilions, from Bjarke Ingels, Vo Trong Nghia and more. 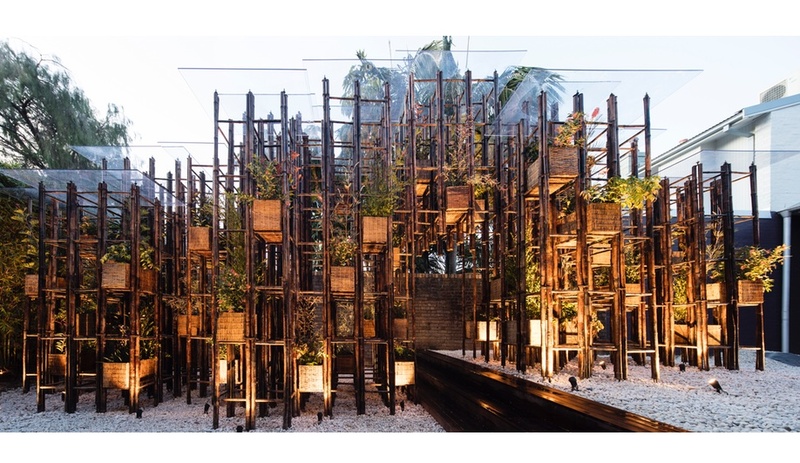 Vo Trong Nghia demonstrates his firm’s dedication to greening urban jungles with this pavilion of bamboo and vegetation, installed at Sydney’s Sherman Contemporary Art Foundation (SCAF). The exhibit is the centrepiece for Fugitive Structures, an annual series at SCAF exploring temporary pavilions as opportunities for experimentation, now in its final year. Nghia’s pavilion features ladders of alternating heights, made from bamboo – which was soaked, then smoked to increase its durability – that support woven planters carrying a variety of greenery and flowers. Visitors are welcome to weave in and out of the scaffolding, taking in the wafting scent of bamboo and living plants. Previously shown in Brisbane earlier this year, Green Ladder will be on display at SCAF until December 10. Bjarke Ingels Group took its cue from children’s bouncy castles when designing SKUM (or FOAM, in English) pavilion, currently installed at CHART Art Fair, an annual contemporary art event in Copenhagen. 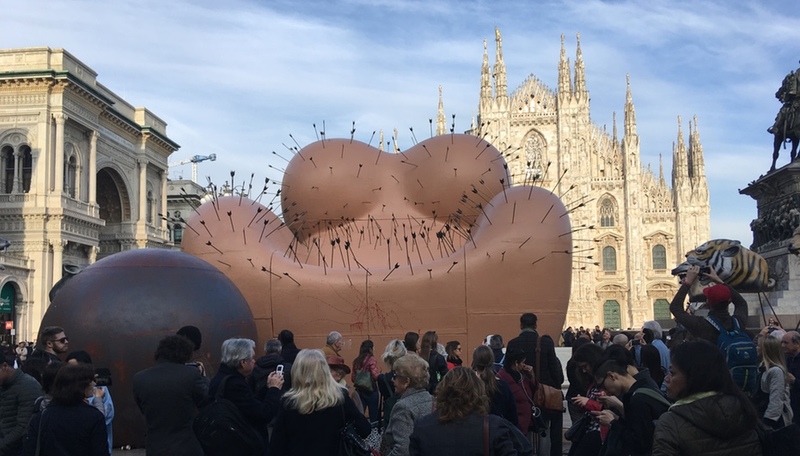 The installation, one of two summer pavilions by BIG this year, uses the same buoyant material and takes a mere seven minutes to fully inflate. 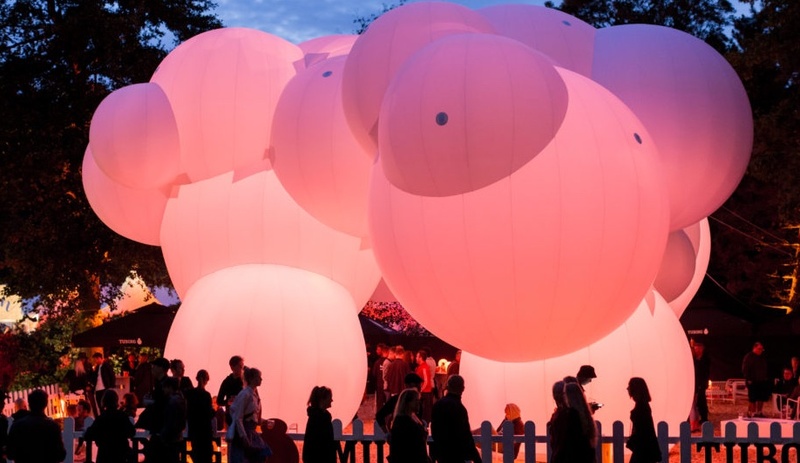 By day, the form resembles a mass of billowing white clouds; at night, LED lights illuminate the bubbles with colour from the inside and out, creating a vivid beacon for fair-goers. At Denmark’s recent Roskilde Festival, one of Northern Europe’s biggest musical festivals, BIG’s pavilion served as the Tuborg beer bar. An abandoned aquatics building in the Rockaways has been transformed from derelict to dazzling, thanks to the signature spray-painting technique of artist Katharina Grosse. Grosse sprays brightly coloured paint directly onto her canvases – typically large-scale and sculptural – and on the landscape and objects that surround them, erasing all borders and creating dimension. 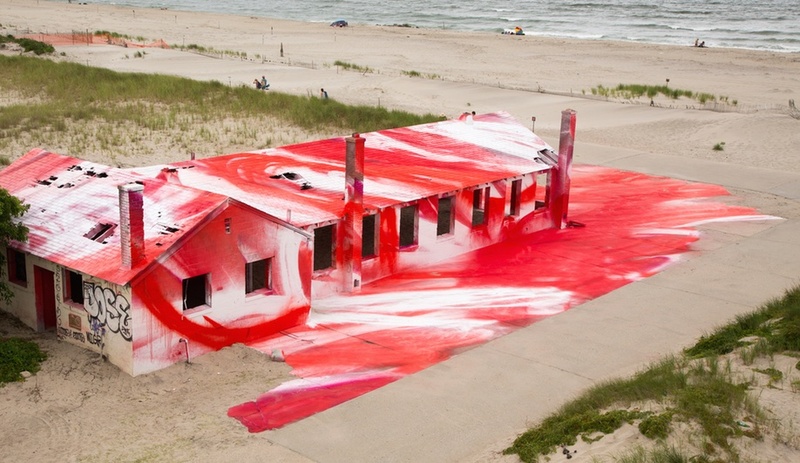 For this exhibit, she treated the building to layers of white, pink and magenta, letting the colours bleed and swirl onto the surrounding sand and sidewalk. Presented by MoMA PS1, Rockaway! is a continuation of the museum’s work with the Rockaway Artists Alliance, a partnership established in the wake of Hurricane Sandy in 2012, in effort to support the oceanside community. Grosse’s work can be seen until November 30, after which the building will be razed. For the 11th annual Manifesta, an international art biennial in Zurich, curator Christian Jankowski put out a call for a pavilion that would house patron seating, an LED screen, a swimming pool and a bar. In return, he received an all-wood floating island, designed by 30 architecture students in conjunction with Studio Tom Emerson, that serves as the central gathering space during the event, which wraps up on September 18. 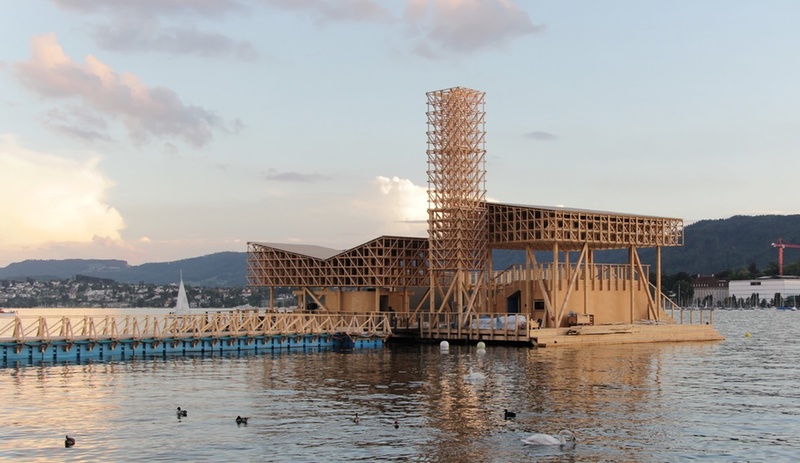 For many of the students, all from ETH Zurich university, the summer pavilion was their first opportunity to bring architectural visions to fruition. The pavilion is both spectacle and venue. Patrons can marvel at its construction while swimming in a contained pool, enjoying food and drink on its decks, and observing film screenings from its spectator stand. 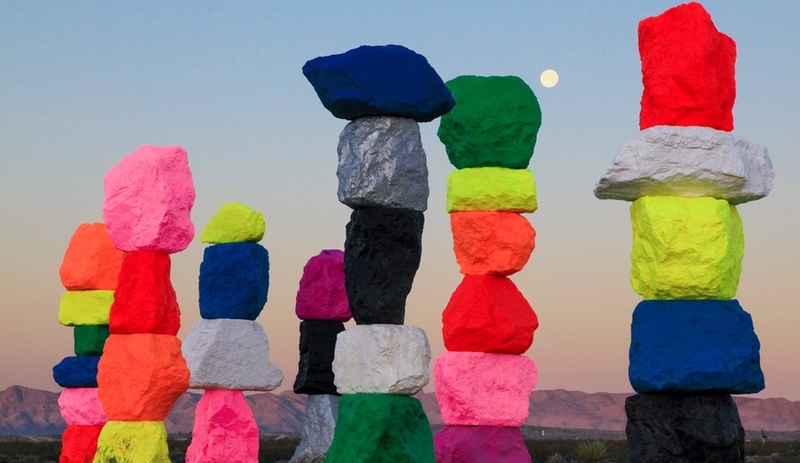 In a stretch of desert just outside of the Vegas strip, Swiss artist Ugo Rondinone has erected seven fluorescent rock towers in what is one of the largest land-art pieces created in the United States in decades. 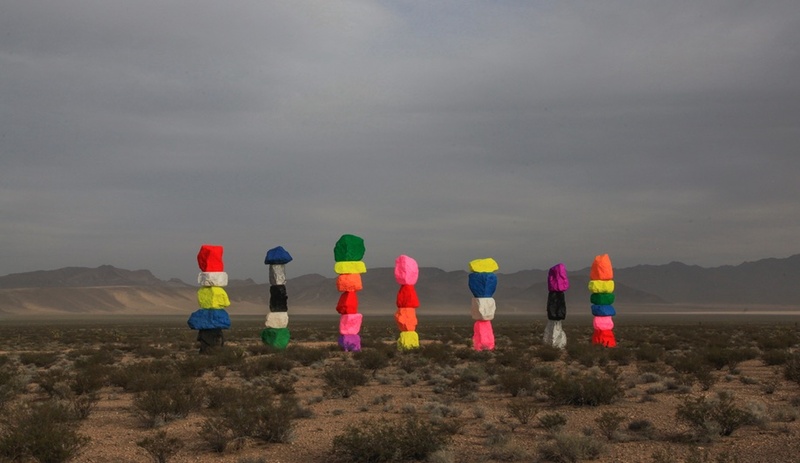 Rising from the dustbed like neon totems, each tower features between three and six limestone boulders – painted in vivid shades including lime green, hot pink and bright orange – stacked over nine metres high. The “mountains” are a reflection of Rondinone’s interest in naturally occurring phenomena and how he reimagines them through art. The installation, which was more than five years in the making, will be on display until 2018.